Where every day is soup day! Vichyssoise is easy and elegant. It doesn't get better than that! Oh, and it's French. Sort of. How is it possible to reach middle-age without ever eating vichyssoise? I know I’m dating myself, but vichyssoise always reminds me of that old Bob Newhart shtick where he pretends he’s a nerdy Pfc.clerk typist in World War II, who was ordered to do phony one-way phone conversations to throw off the eavesdropping Germans. Who would have thought cold potato soup could be so delightful? Its cold, creamy, potato-y-ness is like a savory milk shake and I mean that in the best possible way. It’s easy to make and very easy on the budget. Plus, who doesn’t like saying they served vichyssoise for dinner? There’s a little bit of controversy over this because the French probably invented potato leek soup – the hot kind – first. You say potato. I say vichyssoise. Cest la vie. Wherever it’s from, it’s delish. As usual, I turn to my man Mark Bittman for the recipe. The only change I made was I soaked the cooked potatoes in vinegar overnight. I did this because I thought I was going to make potato salad (this is another great Bittman tip). Put the butter or oil in a large, deep saucepan or casserole over medium heat. When the butter melts or the oils is hot, add the vegetables. Sprinkle with salt and pepper and cook, stirring, for 2 or 3 minutes. Add the stock and cook until the vegetables are very tender, about 20 minutes. Carefully puree the soup in a blender or with an emmersion blender, then return it to the pot. Stir in 1/2 to 1 cup cream, sour cream or yogurt. Add salt and pepper as needed. Chill thoroughly before serving. 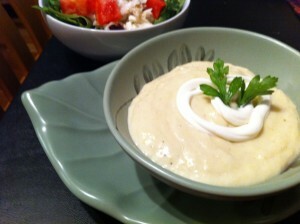 This entry was posted in cold soups, vegetable soups and tagged potato, summer, vegetarian, vichysoisse by soupbabe. Bookmark the permalink.